The US military has reportedly launched 59 cruise missiles at a Syrian Military Airfield on late Thursday in response to a Suspected Chemical weapon attack on a rebel-held town. The Trump administration authorised the operation expanding the US military involvement in Syria and to expose the United States to heightened risk of direct confrontation with Russia and Iran. President Donald Trump remarked that the strike was in the vital national security interest of the US and called on all civilised nations to join the US in seeking to end the slaughter and bloodshed in Syria, and also to end terrorism of all kinds and all types. 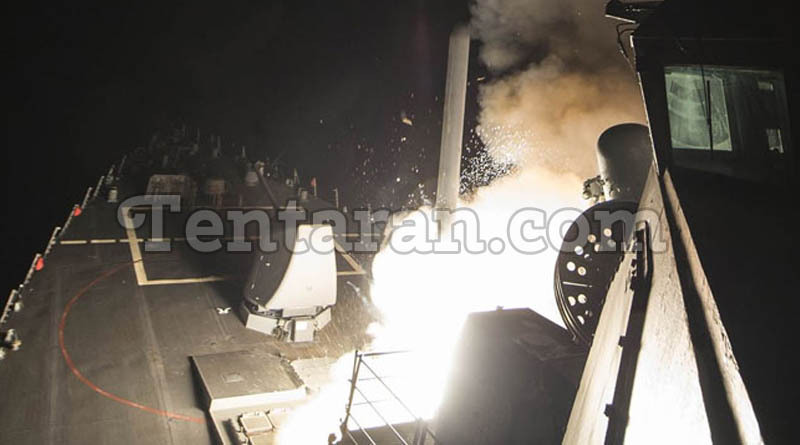 the Missiles were launched from Navy destroyers namely The USS ross and USS porter in the eastern Mediterranean. The Missiles struck the airbase called Shayrat in Homs Province, this is the site from where the planes that conducted the chemical attack in Idlib are believed to have originated. The targets included air defences, aircraft, hangars and fuel.